Irene Ward passed away peacefully on Sunday, April 7, 2019. Irene was born in Platte City on August 15, 1928. Her family later moved to Independence, MO. She worked for Sears and Roebuck as a buyer for more than forty years. Irene’s worked in several locations and as a result she lived in Kansas City, MO, Dallas, TX and Chicago, IL. After she retired Irene returned to Overland Park, KS. After retirement she worked for H&R Block and enjoyed volunteering for Ten Thousand Villages where she met many friends who remained close to her. Irene was active her entire life. She enjoyed collecting Fenton glass and was an active member of the Fenton Club. In addition she traveled all over the world including France, Nepal and China. She enjoyed socializing with friends and loved by many. Irene was preceded in death by her mother and father, Mary Yates Smith, Maurice Orin Smith, sisters Faye Sturman and Mildred Gillum. She is survived by her sister, Marjorie Ray of Raymore, MO, many nieces, nephews and great nieces and nephews. A special thank you to Erika whom she loved dearly. 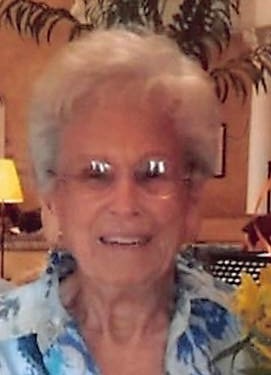 A “Celebration of Life” will be held for Mary Irene Ward on April 27th , 2019 from 4:30 pm to 7:00 pm. The family looks forward to friends and family joining them for this tribute of Irene’s life. In lieu of flowers the family request donations be made to Kansas City Hospice or Ten Thousand Villages. She enjoyed socializing with friends and was loved by many. There's still time to send flowers to the Celebration of Life from 4:30 PM to 7:00 PM on April 27, 2019.